Kisan Mela "Sankalp se Sidhi"
9 Kisan mela has been organise at each district with coordination of District Administration and Department of Agriculture. The theme of the fairs was “Ensuring Better Livelihood Security and Doubling farmers Income”. The main objectives was - 1) Creating awareness of need, importance, policies and programmes for promoting secondary agriculture among farmers, entrepreneurs, developmental experts, scientists and other stakeholders. and 2) Providing an opportunity for exchange of ideas / technologies / innovations and experiences among various stakeholders. More than 2500 farmers participate in each mela and benefits from various Good Agriculture Practices, innovative tools and technical know-how, solutions. A knowledge exchange platform provided during the mela where farmers and expert share their experience / ideas. 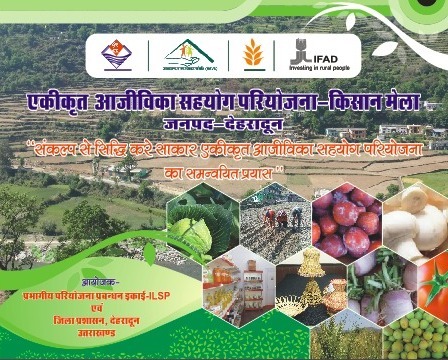 Agriculture – Horticulture Universities, Line Departments such as Agriculture, Horticulture, Sericulture, Fisheries, Veterinary and Animal Husbandry, Industry department, KVK, UREDA, Disaster department, Health, Jalagum, Swajal, Day-NRLM, Anchal, Organic Board and DRDO participate into each kisan melas. The main objective was to share all aspects of vocational training with local unemployed and school dropout youths as per their skills. 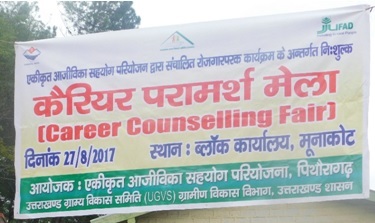 The other aspects of fairs are 1) Check migration of youth from hills, 2) Provide skills to encourage self-employment, 3) Provide skills to gain wage-employment, 4) Provide skills to develop clusters based on activities related to agriculture/ horticulture/ animal husbandry / tourism, and 5), Women empowerment. More than 17500 youths along with their parents have participated into fair. On the other side, all empanelled vocational training agencies provided all details related to trade, training mechanism, placement options, job descriptions, salary range and benefits. Youths and their parents interacted with all agencies and registered themselves after review all prospects of particular trades. A two-day workshop was organised by Uttarakhand Gramya Vikas Samiti (UGVS) on December 08 - 09, 2015 for sustainability of producer groups and livelihood collectives/ federations under an apex organization (proposed) named "Hilanse". More than 222 leaders from different federations / livelihood collective was actively participates, express their views in the workshop. Different brainstorming sessions was organize with different representatives of line dept., boards and participants. The Chief Guest Shri Pretam Singh RD Minister (Uttarakhand) inaugurated the workshop. Mrs. Manisha Panwar, Principal Sectary, Rural Development, Govt of Uttarakhand was special guest. Other invitees are Dr R B S Rawat (Chairman Uttarakhand SSC), Dr Rakesh Shah (Chairman Uttarakhand Organic Board), Shri Vijay Kumar Dondhiyal (Secretary, Uttarakhand Cooperative Dept). Way forward for Self Sustainability :- A two day knowledge sharing workshop was organised by Uttarakhand Gramya Vikas Samiti (UGVS) on January 09 - 10, 2015 for cross pollination of ideas and learnings made by the Federations and Producer Groups (PGs)/ SHGs being supported under IFAD's Integrated Livelihood Support Project (ILSP). The workshop was inaugurated by Hon'ble Chief Minister Uttarakhand Shri Harish Rawat. The workshop was comprised of more than 220 participants from 9 hill districts of Uttarakhand being covered under ILSP including the representatives of 65 federations, Panchayati Raj Institutions, SHGs and Producer Groups. In addition, the event was witnessed by Shri Ganesh Godiyal, Secretary Parliamentary Affairs, Watershed Management and Externally aided projects, Shri Harbans Kapoor, MLA Dehradun Cantt. area, Shri N. Ravi Shankar, Chief secretary Uttarakhand, Shri R.S. Tolia, Former Chief Secretary Uttarakahnd and Chairperson, Public Policy, Doon University, Shri R.B.S. Rawat Chairman Uttarakhand Subordinate Services selection Board, Dr. Kamal Singh, CEO ULDB, Dr. Avinash Anand, CEO USWDB and many dignitaries including Secretaries, Directors of different departments. The event was successful in its cause of bringing various stakeholders particularly the rural community and the institutions on a common platform for sharing the experiences in their livelihood journey and learn from each other. The external participant were instrumental in bringing in new opportunities of businesses for these community institutions. The exhibition put up during the event enabled the stakeholders to showcase their products and gain attention." .